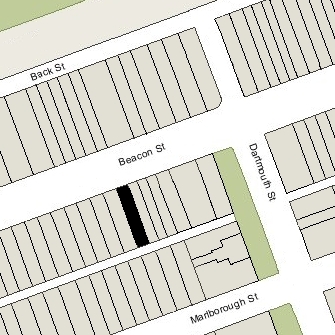 269 Beacon is located on the south side of Beacon, between Dartmouth and Exeter, with 267 Beacon to the east and 271 Beacon to the west. 269 Beacon was built ca. 1871, one of four contiguous houses (263-265-267-269 Beacon) designed as a symmetrical composition, with 263 and 269 Beacon having two-story oriels, defined mansards, and slightly projecting facades, and 265-267 Beacon having one-story oriels. Click here for an index to the deeds for 269 Beacon. 269 Beacon was not listed in the 1876 Blue Book. On February 15, 1876, 269 Beacon was purchased from Eben D. Jordan by Hannah B. (Thayer) Brown, the wife of Henry Howard Brown, a boot and shoe dealer. They previously had lived at 4 Commonwealth with his parents, William and Harriet (Rice) Brown. The Browns continued to live at 269 Beacon during the 1889-1890 winter season, but moved thereafter to Brookline. On November 6, 1889, 269 Beacon was acquired from Hannah Brown by George Henry Cotton, a manufacturer of brass tubing and also the founder of the Belmont Springs Water Company. He and his wife, Cora N. (Doane) Stimpson Cotton, lived at 16 Chestnut and, by the, 1890-1891 would be living at 193 Beacon. They also maintained a home in Belmont. On July 10, 1890, 269 Beacon was purchased from George Cotton by Roland Crocker Lincoln, He and his wife, Alice North (Towne) Lincoln, made it their home. They previously had lived in Manchester, where they continued to maintain a home. Roland Lincoln was an attorney in Boston. Alice Lincoln was active in public welfare issues, and served as manager of the New England Hospital for Women and Children and of the Burnap Free Home for the Aged. On November 23, 1898, he transferred the property into his wife’s name. They continued to live at 269 Beacon during the 1907-1908 winter season, but moved thereafter to Jamaica Plain. On April 15, 1909, 269 Beacon was purchased from Alice Lincoln by Ruth (Perkins) Bailey, the wife of Dr. Walter Channing Bailey. They previously had lived at 267 Clarendon. Walter Channing was a physician and also maintained his office at 269 Beacon. They continued to live at 269 Beacon during the 1913-1914 winter season. By 1915, he had moved his office to 506 Beacon and they were living in Dover. They continued to own 269 Beacon and lease it to others. By the 1914-1915 winter season, 269 Beacon was the home of Rev. George Alexander Strong and his wife, Margaret Phillips (Reynolds) Strong. He had been Rector of Christ Church in New York City until 1913. 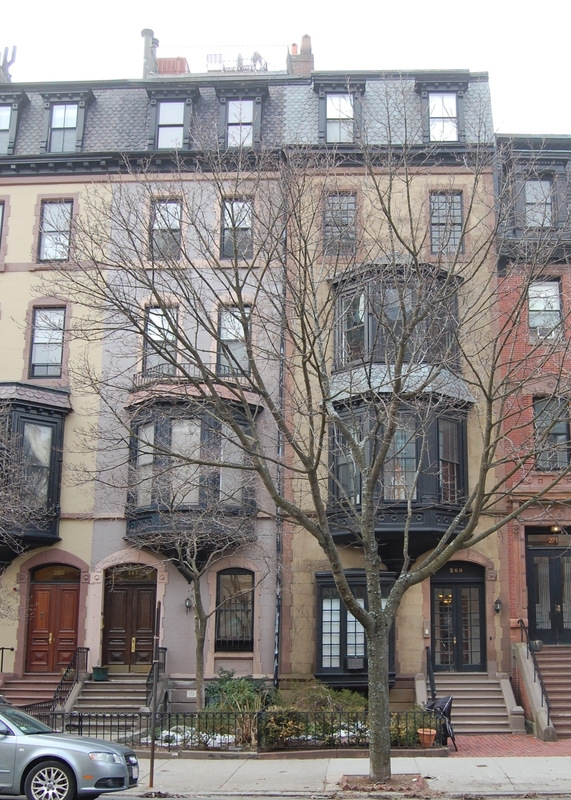 They continued to live at 269 Beacon during the 1915-1916 season, but moved soon thereafter. By the 1916-1917 winter season, it was the home of department store heir Harold Leufroi Chalifoux and his wife, Elizabeth Alice (Burrage) Chalifoux. They had married in November of 1916 and 269 Beacon probably was their first home together. They also maintained a home in Beverly. They continued to live at 269 Beacon until the 1918-1919 season, which they spent in Washington DC, after which they moved to 342 Beacon. During the 1919-1920 winter season, 269 Beacon was the home of British Consul General Henry Gloster Armstrong and his wife, Margaret M. (Hanway) Armstrong. Their usual residence was in New York City. During the 1920-1921 winter season, 269 Beacon was the home of shoe manufacturer Alfred J. Sweet and his wife, Maude (Webster) Sweet. They previously had lived in Lewiston, Maine. By the 1921-1922 season, they had moved to 452 Beacon. 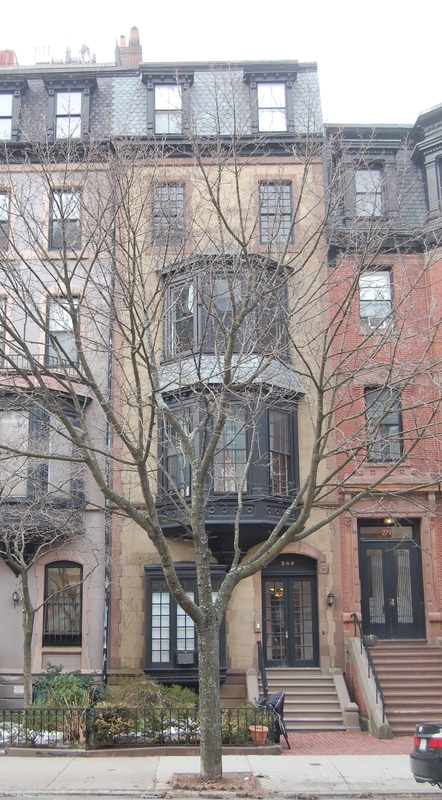 269 Beacon was not listed in the 1922 Blue Book. On August 10, 1922, 269 Beacon was purchased from Ruth Bailey by Eleanor F. (Fabyan) Frothingham, the wife of cotton broker Theodore Frothingham, Jr. They previously had lived at 19 Commonwealth. They also maintained a home in Beverly Farms. During the 1929-1930 winter season, the Frothinghams were living elsewhere and 269 Beacon was the home of Edward Preble Motley, Jr., and his wife, Dorottya (Fremont-Smith) Motley. During the 1927-1928 season, they had lived at 81 Myrtle. They also maintained a home in Hamilton. By the 1930-1931 winter season, the Motleys had moved to an apartment at 6 Arlington and 269 Beacon was once again the Frothinghams’ Boston home. Their daughter, Eleanor (Sissy) Frothingham, was a night-club singer in the 1940s. The Frothinghams divorced in August of 1942 and Eleanor Frothingham remarried that same month to Dr. George R. Luton of Santa Barbara, California. On February 1, 1943, Theodore Frothingham, Jr., acquired 269 Beacon from Eleanor (Fabyan) Frothingham Luton. He continued to live at 269 Beacon and in 1950 remarried to Mrs. Ruth Esther (Warren) MacWilliams Eaton, the former wife of Harold Lee MacWilliams and of Dana Hopkins Eaton. Theodore and Ruth Frothingham continued to live at 269 Beacon until about 1966, when they moved to an apartment at 9 Gloucester. On October 31, 1966, 269 Beacon was purchased from Theodore Frothingham by Rose Rochelle, trustee of the Rochelle Realty Trust. Rose Rochelle (Goldberg) Levin Glazer Bornstein was the former wife of Reuben Levin and Max L. Glazer. She was a retired pianist and entertainer who performed as (and legally changed her name to) Rose Rochelle. She had married in the early 1960s to Morris Bornstein, after which she was known as Rose Bornstein. He died or they separated by 1965. She owned and lived in an apartment house at 273 Beacon, and also owned several other apartment buildings and lodging houses in the Back Bay and South End. 269 Beacon was shown as vacant in the 1967 and 1968 City Directories. On February 7, 1968, 269 Beacon was acquired from Rose Rochelle by Russell J. Amaral, trustee of the Ramsey Realty Trust. In January of 1968, prior to taking title, he filed for (and subsequently received) permission to convert the property from a single-family dwelling into eight apartments. On December 15, 1968, he transferred the property to Quabin Realty, Inc., of which he was the treasurer. On March 29, 1971, 269 Beacon was acquired from Quabin Reallty by E. Janet Lovell. On June 15, 1976, 269 Beacon was acquired from E. Janet Lovell by Betty Bishop and Rosalie M. Buck. On September 1, 1976, they converted the property into nine condominium units, the 269 Beacon Street Condominium.